Peloton was designed and developed in the USA to make home exercise bikes more interesting and fun. The Peloton system uses the internet so that users can race friends, join groups in training sessions all to increase their fitness without having to leave home. To show how addictive these exercise units are, in the USA, ready built display units, complete with the systems installed are shipped into pre-determined sites, but unfortunately the UK doesn’t have display buildings large enough to ship these units in one piece. The Peloton company then turned to the expertise of Arkoni to design and manufacture a fabricated kit that could simply be delivered to any site and easily put together. 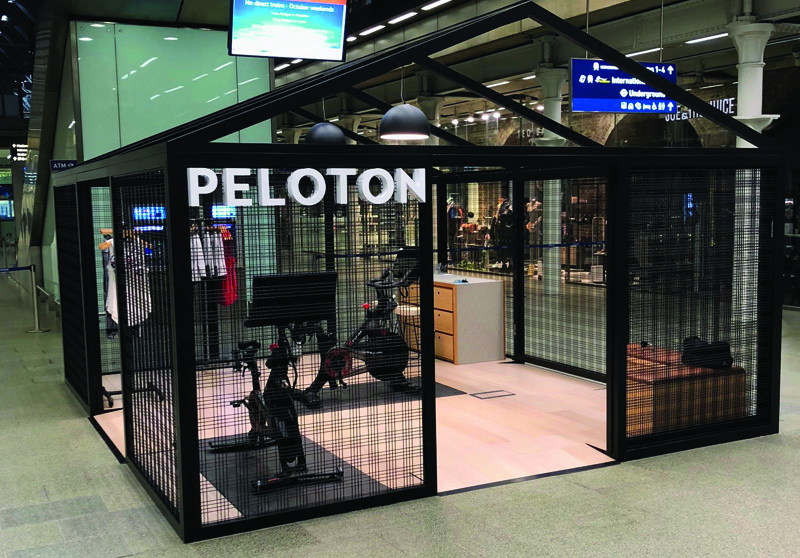 The first locations in the UK are based at St Pancras station London, White City, Manchester, and at Peloton stores at Canary Wharfe, Spitalfields and Kings Road, Chelsea. The Peloton company was so pleased with the Arkoni outcome, that they intend to role out many more display units.